Marianthe Grammas, MD visits on a house call with a 74 year old patient. Birmingham can be proud of having some of the most advanced health care resources on the planet. But for patients who are house-bound, those resources can be as inaccessible as if they were a world away. "UAB physicians have been making house calls for years on an informal, case-by- case basis as the need was identified. However, we were seeing so many frail patients in the ER and in the hospital who were there because they missed their last doctor's appointment. Problems that could have been recognized and addressed in an earlier stage turned into a crisis," Marianthe Grammas, MD, director UAB's House Calls program, a program run out of , said. Forgetting appointments usually has little to do with why patients miss them. Some have mobility problems, or are unable to drive and don't have anyone who can take them to their doctor visit. Others have chronic conditions that make it difficult to leave their home. Short of paying for an expensive ambulance ride to the doctor, there is simply no way to get there. "From the perspectives of both outcomes and cost, waiting for a crisis to develop is not a good way to get health care. We wanted to see if we could reduce ER visits, readmissions and costs while improving outcomes by taking primary care to patients who couldn't come to us," Grammas said. 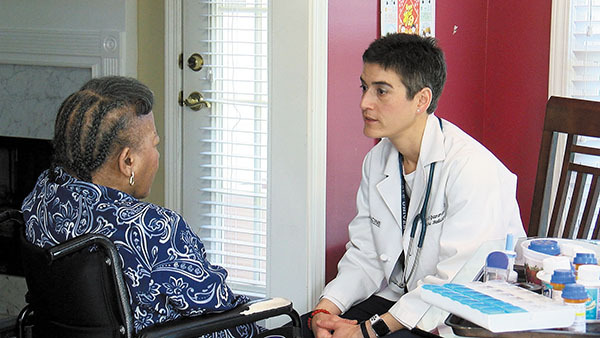 Planning for the House Calls program, run out of the Division of Gerontology, Geriatrics and Palliative Care at UAB, began with getting a better understanding of the risk factors that could help to identify patients likely to need in-home visits. Geriatric patients were most likely to benefit, but in-home visits can also be helpful to younger patients who have severe chronic conditions or serious injuries. After securing funding and staffing the team, the program was launched in 2015. "In addition to a physician and two nurse practitioners, we have a nursing case manager, a medical assistant and a social worker," Grammas said. "We usually visit the patient in teams of two, and sometimes we bring medical students with us so they can help and learn about providing care in a home-based setting. We can do labs, x-rays and most of the procedures you'd expect to find in a primary care office while we are there. "Being in the patient's environment also allows us to see what their day is like and note factors that might be putting them at risk of falls or other injuries. We can review their medications to make sure they have them, still need them, and are taking them correctly. If the cost of their medication is a problem, we may be able to put them in touch with assistance or change their prescription to a less expensive alternative. "For many older and poorer patients, food security can be a problem. Nutrition is a big part of staying healthy, and we can make sure they have enough food in the house. If not, our social worker can put them in touch with other food resources." With age comes the toll that time takes on body and health. However, the ultimate objective of geriatric care is to help make the later years as healthy, productive and fulfilling as possible. In the three and a half years since House Calls began, tracking data is showing that many of the goals it set out to accomplish are being achieved. "ER visits are down 50 percent and hospitalization and readmissions are also down significantly," Grammas said. "Although many of our patients are older and frail, 77 percent of those who have passed away were able to die at home in a comfortable environment with family. That rate is much better than typically seen in that age group." House Call also files insurance and Medicare claims the same as most other primary physicians. And they work with specialists and other providers to keep the entire care team up to date. "We're currently seeing around 250 patients within a 30-mile radius," Grammas said. "Similar programs are being offered in other cities. In the future it would be wonderful if house calls were available everywhere." Наш нужный веб портал с информацией про система полива.